Most aircraft are also equipped with an outside air temperature (OAT) gauge calibrated in both degrees Celsius and Fahrenheit. It provides the outside or ambient air temperature for calculating true airspeed and is useful in detecting potential icing conditions. In a fuel injection system, the fuel is injected directly into the cylinders, or just ahead of the intake valve. The air intake for the fuel injection system is similar to that used in a carburetor system, with an alternate air source located within the engine cowling. This source is used if the external air source is obstructed. The alternate air source is usually operated automatically, with a backup manual system that can be used if the automatic feature malfunctions. The auxiliary fuel pump provides fuel under pressure to the fuel-air control unit for engine starting and/or emergency use. After starting, the engine-driven fuel pump provides fuel under pressure from the fuel tank to the fuel-air control unit. This control unit, which essentially replaces the carburetor, meters fuel based on the mixture control setting and sends it to the fuel manifold valve at a rate controlled by the throttle. 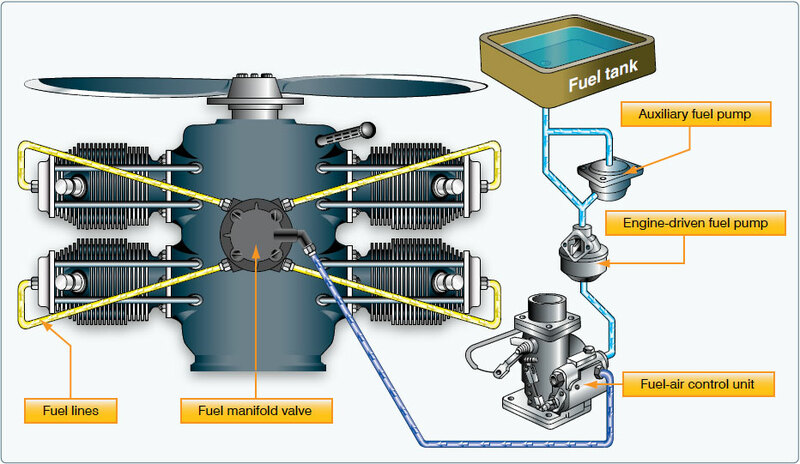 After reaching the fuel manifold valve, the fuel is distributed to the individual fuel discharge nozzles. The discharge nozzles, which are located in each cylinder head, inject the fuel-air mixture directly into each cylinder intake port. A fuel injection system is considered to be less susceptible to icing than a carburetor system, but impact icing on the air intake is a possibility in either system. Impact icing occurs when ice forms on the exterior of the aircraft and blocks openings, such as the air intake for the injection system.